In the center of all sightseeing of Peloponnese: Generally driving distances are small and a cultural excursion can perfectly be combined with a few hours of swimming, fun on the beach or walking in the mountains. You can taste over 50 specialties according the Greek Mediterranean cuisine. Staying in Kalo Nero is a unique chance for holidays in the country of Gods, Greece, near all major, archaeological and historical places like Olympia, Ithomi, Vasses, Pylos, Mystras, Monemvasia. Kalo Nero Kyparissias is a favourite with both locals and visitors thanks to its traditional Greek taverns that serve local specialties, like suckling pig-rost small pig ''psiti gourounopoula'', a wide variety of sea food, regional ouzo and Messinian wine. It is highly recommended to make an excursion to Neda waterfalls, for swimming at the beautiful blue lagoon. Surely Kalo Nero's trademark is Neda, the famous river that travels you to the Greek mythology or the way of your dreams. The river hides a huge variety of pictures: torrents, etc. Neda River natural waterfalls, Ancient Olympia: The unique Neda River with natural waterfalls, the Temple of Apollo always pointing the North, the Lykaion- Temple of Zeus-Dias, the Lykosoura, the Olympia with famous Hermes of Praksitelis statue, the medieval Castles, in Kyllini, Kyparissia, Methoni, Koroni, the vaulted tombs of King Nestor's in Peristeria, the old port in Katakolo, the pine-clad Kaiafas beach with the gold sand and the hot- water springs, suitable for Cholelithiasis and kidney stones, the Lepreon and many places well-known from Homer's Odyssey, are some of the many places that worth's one to visit. Watching Caretta-Caretta turtles, pristine beaches: You have to remember that the area constitutes a unique ecological park of protection and investigation of turtle Caretta-Caretta (Natura area). The visitor is been called to respect the laws of the nature, to share unforgettable experiences, like watching, and touching the cute young turtles, Caretta-Caretta crawling on the sand. The Irida Resort is provided with reception and a private farm with fruit trees. From April to October there are charter flights to Kalamata Airport and Araxos Airport (Patras), from various European cities. Also, there are daily scheduled flights from most European countries to Athens International Airport. The distance Athens -Tripoli - Kyparissia is 240 Km long and can be covered by car in approximately 2.30 hours. The road takes you through the vineyards of Korinthia and the mountainous masses of Arcadia before you reach the fertile Messinian valley. If required we can make arrangements for a transfer by taxi or a rental car. Irida Resort is a cultural oasis in Kalo Nero's most successful tourism resort. Ideal place with settlements for individuals, families, youth, children's rest in the Paralia Kalo Nero. Today, the village has developed into a well-organised tourist resort with all the comforts. Irida Resort is a secluded and spacious 10-apartments Guest House with sea views, large terraces, surrounded by green farms. 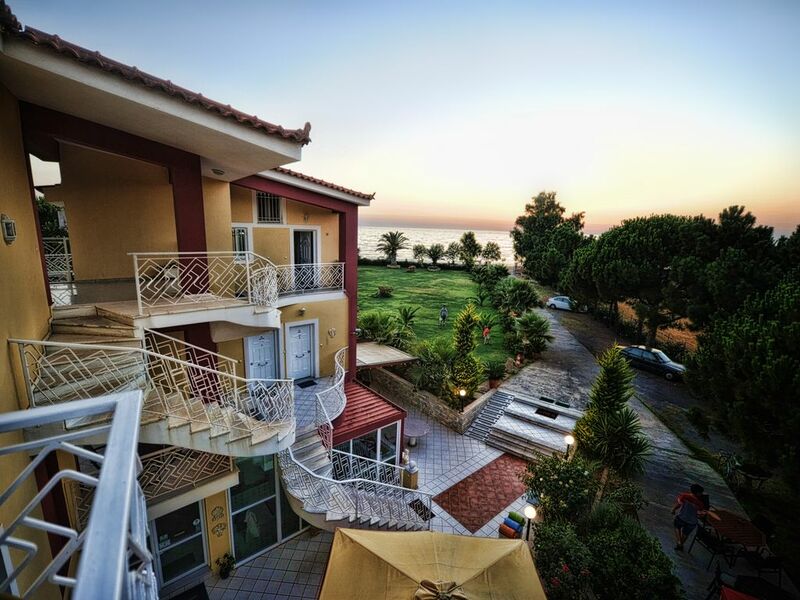 Set in a prime location in the Kyparissian Bay, is in walking distance to bars, shops, beaches and in the middle is the complex of Irida Resort Apartments.It offers Greek Hospitality. The owner of Irida Resort helps you to explore Neda Waterfalls with Stomion. Irida Resort is a cosy, newly built place ideal for relaxing and exploring the Messenia. All apartments have a unique color and are named after Iris, the messenger of Gods and humans. The apartments are well appointed with Sea View. They are tastefully furnished and they combine the comfort with luxury. All rooms are fitted with a card cut-electricity system and have been furnished to the highest possible standards, including all the conveniences you, the discerning business traveller or holidaymaker, have come to expect. Sea View, offering contemporary design and comfort, International direct-dial telephone, TV flat screens 32 LCD or LED with satellite programs and music channels, cd player, Alarm clock-radio, tea & coffee facilities, hairdryer, safe, mini bar/fridge (mini bar service on request) safety box (complimentary), air-conditioning/heating (individually adjustable per room), Anatomical - Orthopedic mattresses, double glazed windows, fully equipped kitchen, Free Wi-Fi internet access, Soundproof windows with Mosquito Meshes, Large mirror, Bathroom with bathtub or shower cabinet. Exclusive bathroom amenities and complimentary toiletries, Magnifying mirror, Shaver plug, Balcony with furnishing, Granite tile floor, Indoor space approx. 25 m2. Cleanness, positive energy, relaxation, and regeneration. Baby cot is available for free upon request. Non smoking rooms. In these apartments you will experience the glorious Greek hospitality. The Best Western Irida Resort family Hotel is located a few short steps away from the Kalo Nero pristine beach, where you can enjoy nature gifts of sun, sand and surf ! Our beautifully appointed apartments, fully equipped apartments, ensure a comfortable and relaxing vacation. Relax on the huge verandas where you can enjoy your drink or your coffee or stay at the garden of the hotel for entertainment. The warm hospitality of the family will make you feel at home and help you plan your excursions around the western parts of Messinia. Or just spend the day on the spectacular beach of Elaia-Elea, under the forest of tree-pines. Create memories that linger, long after the moments have past... The Irida Resort Apartments are owned and operated by a Classic Greek family and is very close to the beach. All of its 10 self catering apartments are spacious and comfortable, warmly furnished and can sleep up to 5 persons. The lush green garden provides a tranquil environment for the guest. From here you can organize daily excursions to interesting places, such as the gorge of Neda, the ancient temple of Epicurius Apollo, lake Kaifas with Spa hot springs and many more sites, which they will give you an enchanting option for exploring, during your holidays. Create memories that linger, long after the moments have past... The Irida Resort Apartments are owned and operated by a Classic Greek family and is very close to the beach. All of its 10 self catering apartments are spacious and comfortable, warmly furnished and can sleep up to 5 persons. The lush green garden provides a tranquil environment for the guest. From here you can organize daily excursions to interesting places, such as the gorge of Neda, the ancient temple of Epicurius Apollo, lake Kaifas with Spa –hot springs and many more sites, which they will give you an enchanting option for exploring, during your holidays. The village of Kalo Nero is a retreat the last years. You can find here many Greek taverns, restaurants, mini markets, grocery, bakeries. From all the balconies you can see marvellous sunsets and the blue sea..
On the nice beach of Kalo Nero where turtles Caretta-Caretta lay their eggs for nesting. There is an extra charge for this. It is free all over the builing. We provide you for free. We afford you for free . You can have home made dishes, with fresh local products.Greek or European kitchen. You have the chance to play at a nearby Hotel, Costa Navarino. We provide you for rent. Warm hospitality, lovely apartments, very clean, good beds. Very good breakfast. Owners and their family are very warm, friendly and helpful. Very close to the sea and beach with facilities. Sea turtles and humans live together on the beach. Lovely taverns nearby. Classical culture (Olympia) in de neighborhood. Also beautiful nature (Neda waterfalls) and small villages and towns. We surely do recommend this property to friends or relatives. Thank you very much for your kind words and detailed information to other geusts. You are always welcome to return to our place. We highly recommend this Resort! We had an wonderful Stay in this Apartment. The Day when we arrived, we were welcomed very lovely. The Rooms were very clean and from the Balkon we could see and hear the beautiful sea. It was just great to get up in the morning and look at the sea. Every morning we had an breakfast, which was the best we ever had. We could taste the fine Greek cuisine. The Resort is located just in front of a beautiful long beach. So it needs less than 1 minute to reach the sea from the room. And it's possible to see the sunset at this beach. Kosta, the owner, gives very good tips for sightseeing in this area. He could answer every question we had about the area (for example: where we could buy local products). He makes also his own wine, and it's great! We give to this resort 15 out of 10 Points, and we come back next year for sure! From the moment we arrived on the hotel premises we instantly felt a sense of complete warmth. The hotel owners greeted us in such a friendly manner. Our room was outstandingly clean with a beautiful balcony view. You could hear the sea from our room. We were served an excellent homemade breakfast. The sea was very calm and warm for the month of November. The walk along the seashore is very peaceful and relaxing. The resort premises is very scenic with a children's playground and comfortable lounge chairs. I give this resort an outstanding review and I intend to return to this resort again in the near future. Kostas and Rena made extra effort to ensure we had a wonderful stay. Breakfast was fabulous. Beach sunsets spectacular. Room very well appointed, with excellent mattress for good nights sleep. Grounds immaculate with play area including slide etc for children. Would give it 12 out of 10. Exceptionally lovely location- our room had a large balcony/terrace overlooking the sea. The beach is expansive for walking in both directions. The hosts are charming and helpful- Rena is an incredible cook who presented us with a feast for breakfast. Kostas makes his own wine and in addition to his excellent conversation, is a master guide to the region. Thank you very much for your kind words. It is our pleasure to host guests, who appreciate our efforts to cater them, offering unforgettable vacations..We hope to see you again coming. Visiting the unique Neda River with 3 natural waterfalls (N37 23.576' & E21 49.435') and exploring the unique Cave Stomion with Mystery, ESP phenomena, an enter to Ades and the 3 species of bats.The Temple of Epicurious Apollo or Bassae, always pointing the North with nearby Temples, of Artemis and Afrodite. The Mt. Lykaion (N37 26.983' & E21 59.036') with Temple of Zeus-Dias, Sanctuary of Pan and the Lykosoura, with Temple of Despoina and Demeter. The Olympia with the New Museum, with famous statues, Hermes of Praksitelis and Nike of Paioniou. The Ancient Ithomi, ancient Messene in Mavromati (well maintained Ancient city, 8th century B.C. ), near Voulcano. Golf: Nearby at Romanos, you can use the 18 holes Golf court.. at Costa Navarino complex. Ski: Water ski at Kaiafas Lake and ski at the sea at the beaches of Messinia. RENTAL RULES 1. Smoking is allowed outside only. 2. People other than those in the Guest party set forth above may not stay overnight in the property. Any other person in the property is the sole responsibility of Guest. 3. All of the units are privately owned; the owners are not responsible for any accidents, injuries or illness that occurs while on the premises or its facilities. The Homeowners are not responsible for the loss of personal belongings or valuables of the guest. By accepting this reservation, it is agreed that all guests are expressly assuming the risk of any harm arising from their use of the premises or others whom they invite to use the premise. 4. Keep the property and all furnishings in good order 5. Only use appliances for their intended uses 6. PETS are permitted only with prior approval and the Pet Addendum must be completed. 7. Parking:– Vehicles are to be parked in designated parking area only. Parking on the road is permitted. 8. Housekeeping: There is no daily housekeeping service. While linens and bath towels are included in the unit, daily maid service is not included in the rental rate. We suggest you bring beach towels. We do not permit towels or linens to be taken from the units. 9. Hot Tub: No children under the age of 12 is permitted in hot tubs at any time without adult supervision. When using the hot tub, remember there is a certain health risk associated with this facility. Use at your own risk. Our housekeepers drain, sanitize, refill and replenish chemicals in all tubs prior to your arrival; therefore, it may not be warm until later that evening. 10. Water and Septic: The property is on a well and septic systems. The mineral content in the water is high. During a drought, the well water may have an odor. The septic system is very effective; however, it will clog up if improper material is flushed. DO NOT FLUSH anything other than toilet paper. No feminine products should be flushed at anytime.